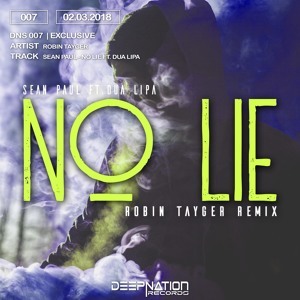 Sean Paul - No Lie Ft. Dua Lipa (Robin Tayger Remix) [DNS007]. Sean Paul - No Lie Ft. Dua Lipa (Robin Tayger Remix) Youtube Upload - https://youtu.be/1JtbkHoGhGo DeepNation - Only the best house music. » Spotify: https://open.spotify.com/user/deepnationrecords/playlist/1cE9LXH95fRz759706AmA4 » Facebook: http://www.facebook.com/DeepNation1 » Instagram: http://www.instagram.com/deepnationireland/ » Soundcloud: https://soundcloud.com/deepnation1 » DeepNation Merchandise: https://shop.spreadshirt.ie/deepnation/ ✘ Follow: Robin Tayger http://spoti.fi/2xCCr53 http://apple.co/2ylKS8u http://bit.ly/2xDSaAX http://bit.ly/2ghrxzh http://bit.ly/2g8AMho http://bit.ly/2yIG2Um Picture by: Erik Odiin https://unsplash.com/@odiin Make sure to subscribe and turn notifications on to keep up-to-date with the music we share, if you use Snapchat make sure to follow us: DeepNation and join the #snapfam For any submissions or copyright issues drop an email to: contact.deepnation@gmail.com DeepNation is a House dedicated music-blog, record label & event brand. Founded in April 2017.